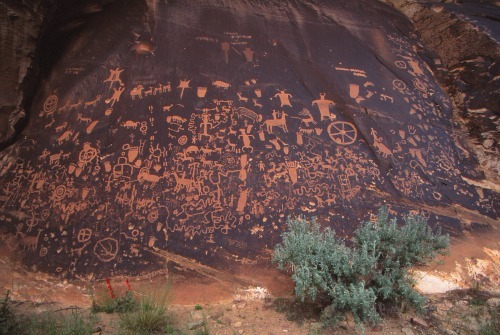 Newspaper Rock, located along Indian Creek in southeastern Utah, is a 200 square foot sandstone rock which was used as a canvas by ancient rock artists. It is believed that the petroglyphs found here were made by various cultures over the last several hundred years. The oldest culture reflected here were the ancestral Puebloans, followed by the Fremont people and then the Utes and Paiutes. 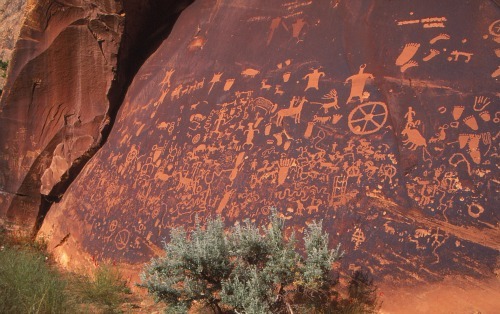 There are more than 200 petroglyphs at Newspaper Rock, and it is one of the largest, best preserved and easiest accessed group of petroglyphs in Utah. Newspaper Rock is situated within the Canyon Rims Recreation Area between the towns of Moab and Monticello, 12 miles west of US 191 off Hwy 211. 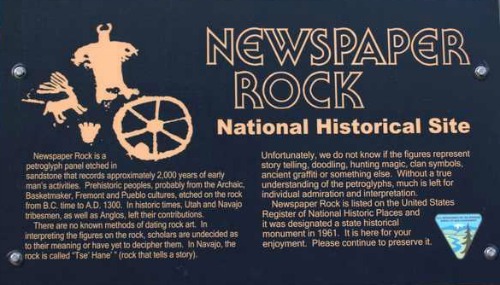 Newspaper Rock State Historical Monument is open 365 days a year, 24 hours a day. This day-use site has toilet facilities and plenty of paved parking. To Check on Current Weather in Moab, Utah, Click Here. 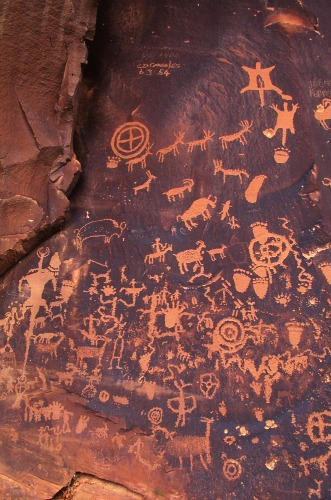 To Find Books From Amazon.com About Petroglyphs, Click on the Link Below. There is no lodging within the monument. The closest lodging is in the towns of Monticello and Moab, Utah. Monticello is 24 miles northwest of the monument, and Moab is 50 miles north. To find lodging in either of these towns, use the Search Box on the right. There is no camping at the monument. The old campground was closed in 2006 and it is illegal to camp there. Squaw Flat Campground is operated by the Needles District of nearby Canyonlands National Park. Squaw Flat is located approximately 25 miles northwest of Newspaper Rock and is reached by continuing on Hwy 211 from Newspaper Rock. There are 26 sites available on a first-come, first-served basis. Maximum RV length is 28 feet. Squaw Flat typically fills every day from late March through June and again from early September to mid-October. Group size limit is 10 people and 2 vehicles. 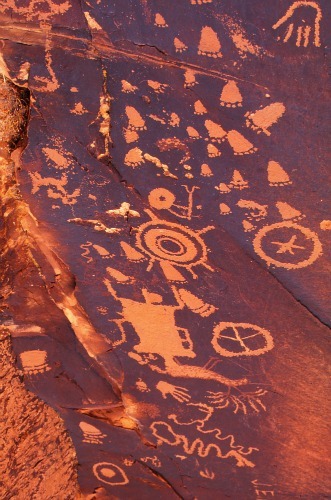 Many people new to Lake Powell Country and the Grand Circle have difficulty understanding some of the designations used in describing this ancient rock art. These ancient artists carved, chiseled, etched or pecked into the rock a variety of designs and symbols: animal, human, celestial and abstract. They were most likely pecked or chiseled by using two handheld rocks, one used as a hammer and the other as a chisel. Pictographs, on the other hand, are images and designs painted on a rock surface. The paints were made from colorful plants and minerals which were ground up and mixed with liquids such as egg, blood or urine. The pigments were applied using sticks, yucca fiber brushes or simply the artist’s fingers or hands. “Desert Varnish, sometimes called rock varnish, is a thin coating (patina) of clay particles that are deposited on rocks in desert environments. These clay particles are attached to rock surfaces by bacteria that live there. The presence of manganese with the clay particles gives desert varnish a dark color, while the presence of iron causes it to appear red. “Repatination refers to the re-coloration, or the re-growth of the desert varnish after a petroglyph image has been created. Why were the petroglyphs made? 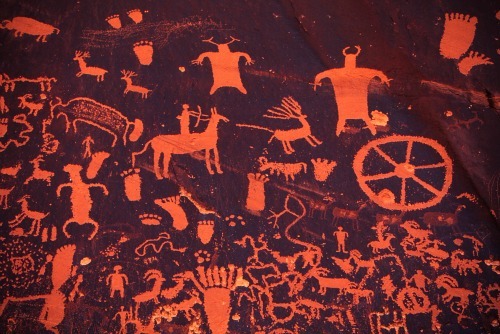 No one knows for sure why petroglyphs were made. There is currently no widely accepted method of exact dating for petroglyphs and pictographs. The bow and arrow came into use in the southwest approximately A.D. 500 and the horse was introduced to the southwest after A.D. 1540. If a petroglyph or pictograph depicts either of them then we know the relative date in which they were made.